New Year’s Eve, Tuesday, December 31, is a time to reflect, look forward and party like there’s no tomorrow! For years, Chicagoans have come to celebrate special occasions in the Division Street Entertainment District, better known as Rush and Division, at The Original Mother’s, The Lodge Tavern, The Hangge-Uppe, Mother’s Too, She-nannigans House of Beer, Bootleggers, Pippin’s Tavern, Streeter’s Tavern, as well as Lincoln Park’s River Shannon and River West’s Mahoney’s Pub & Grille. 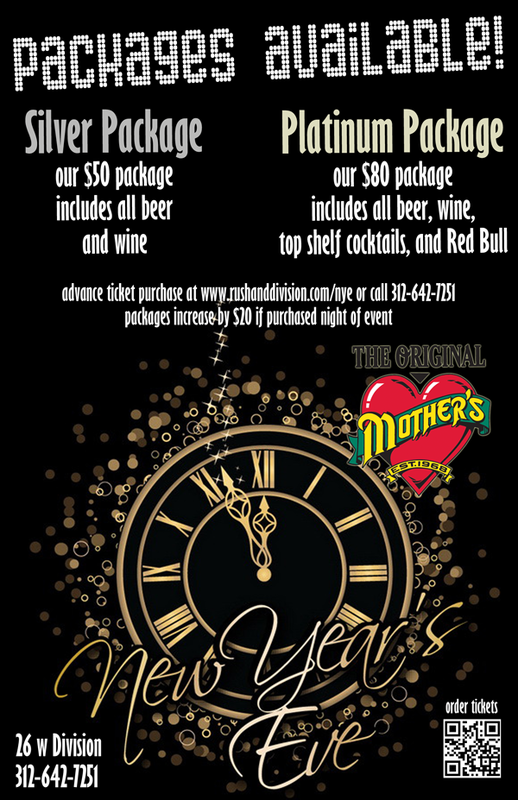 This New Year’s Eve, The Original Mother’s will be open from 8pm to 4am and offer two advanced ticket packages: a $50 Silver package will include all beer and wine, and an $80 Platinum package will include all beer, wine and top-shelf cocktails, including Red Bull, both from 9pm to 2am, with a DJ playing 2013’s top songs, all night long. Tickets may be purchased in advance online at http://rushanddivision.com/nye/ or by calling 312-642-7251. These packages, if still available on December 31, will increase by $20 at the door. The Hangge-Uppe will be open from 7pm until 4am and offer a $60 package from 9pm to 1am which will include beer, wine and top shelf cocktails with a DJ spinning the best of 2013 music. Tickets may be purchased in advance, online at http://rushanddivision.com/nye/ or by calling Gina at 312-664-6656 x 120. Mahoney’s Pub & Grille will be open from 4pm until 2am and offer an advanced $50 ticket package which will include beer, wine, top-shelf cocktails, hors d’oeuvres and desserts from 8:30pm to 12:30am. There will also be a champagne toast at midnight and party favors along with a DJ playing party favorites from 2013 and more. The package excludes shots, Red Bull drinks, and premium liquors. Tickets may be purchased in advance online at http://rushanddivision.com/nye/ or by calling 312-733-2121. The package price will increase $10 if purchased after December 25, if still available. The Original Mother’s is located at 26 West Division Street in Chicago – 312-642-7251; The Lodge Tavern is located at 21 West Division in Chicago – 312-642-4406; The Hangge-Uppe is located at 14 West Elm in Chicago – 312-337-0561; Mother’s Too is located at 14 West Division – 312-266-7444; She-nannigans House of Beer is located at 16 West Division – 312-642-2344; Bootleggers is located at 13 West Division Street in Chicago – 312-266-0944; Pippin’s Tavern is located at 806 North Rush Street in Chicago – 312-787-5435; Streeter’s Tavern is located at 50 East Chicago – 312-944-5206; River Shannon is located at 425 West Armitage in Chicago – 312-944-5087; and Mahoney’s Pub & Grille is located at 551 North Ogden in Chicago – 312-733-2121. Please visithttp://rushanddivision.com/nye/ for more details.